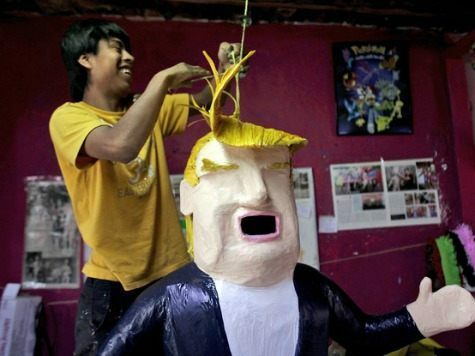 A shop in Mexico is now carrying a Donald Trump piñata. This comes after the GOP presidential candidate made his remarks about illegal immigration through the southern border. “The urge to beat at Trump with sticks until lollipops start pouring out came just as he declared that he was banning all Univision employees from his Miami golf course—hisresponse to the Spanish-language station cutting ties with his Miss Universe Organization, also a direct result of his comments,” reported E Online. Breitbart News previously reported on Trump’s public letter banning Univision representatives from his property and also noting that if he becomes president, Univision can tell the Mexican government that Trump will be bringing jobs back from Mexico to the United States.